Proud Cristiano Ronaldo shared a heartwarming picture with his young family for the first time. 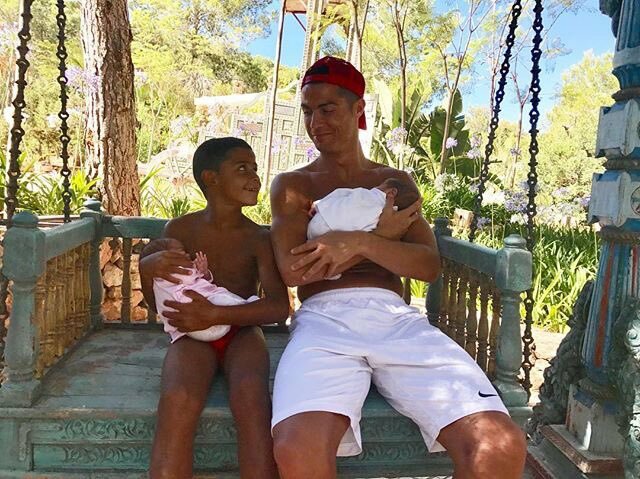 The Real Madrid superstar confirmed to the world last week that he had become the father to newborn twins, Eva and Mateo. And the beaming 32-year-old to took Instagram to reveal how he was “blessed” as his seven-year-old son Cristiano Jnr sits smiling alongside him as they share a tender family moment. It was believed the two twin children were born in the United States and had been visited by Ronaldo’s mother. Last week Ronaldo’s siter, Katia, told Portuguese TV he had welcomed a girl and a boy, called Eva and Mateo, into the world. The news had not been made official, before Ronaldo confirmed their birth on Facebook on Wednesday night.